Every morning this week I have awakened to a songs from my youth that depict God the Father and Son being “sweet.” I have posted the songs on my personal Facebook feed with numerous responses. But the idea of the Father and Son being a sweet taste is not a literal translation. After all, we have to use our mouths in order to get the sweet taste to register in our brains. In all my years of Bible study, training, preaching, teaching and counseling I still have not experienced the actual sweet taste associated with my faith in Jesus Christ in a physical manner. Trust me, I truly have a sweet tooth and love desserts – with the exception of cheesecake and exclusively chocolate creations. I mostly enjoy the sensation of peach cobbler, Haagen Dazs Dulce De Leche ice cream and french vanilla flavored coffee constantly registering my sweet taste buds as I savor the individual flavors as long as possible. In my vast experience with sweet tasting treats, experiencing the sweetness associated with faith in Jesus Christ is extremely more satisfying. David’s sentiment implies the urgency he developed for trusting in the LORD. He was on the run from King Saul at the time of the writing. He feigned being a madman to avoid harm to him. He had no human aid he could trust in. Yet day by day, the LORD kept David alive, safe, secure and provided all his needs while on the run for his life. When you read the back story of Psalm 34 in 1 Samuel 21 and 22 you get a deeper sense of his personal need for Divine Providence. God provides for His children! 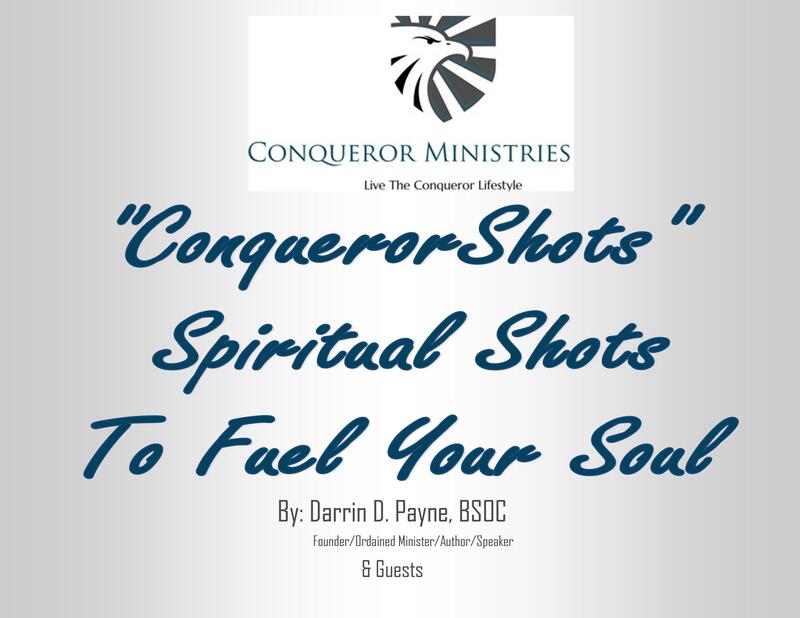 ConquerorShots will always make the distinction between Old Testament lessons and New Testament Christian theology. We must all adhere to the urgency David writes about with fervor and diligence. With regards to David’s faith, the LORD is translated as Jehovah – the self revealing one. In other words God revealed His character through the names of Jehovah. David, being a son of Jesse, was an Israelite man with great promise attached to his bloodline. The Davidic covenant directly lines up with the millennial Kingdom prophesied through the Old and New Testaments. A Earthly promise which has yet to be fulfilled. Therefore, Christians have a completely different faith experience regarding God. Christianity allows for a specific faith in CPR² that David did not have available to him. Jesus Christ’s death, burial and resurrection changed the way in which mankind relates with God making Christianity totally different from religion. We can identify with David’s experience “tasting and seeing that the LORD is good” but we have a more intimate connection to His goodness. Christian faith insures the Spirit of Christ in us adopting us into God the Son and making us joint heirs with Him eternally. THIS IS A HEAVENLY PROMISE THAT IS COMPLETELY SEPARATE FROM THE EARTHLY PROMISES MADE TO ABRAHAM REGARDING THE CONSTRUCTION, DEVELOPMENT AND MAINTENANCE OF THE CHOSEN RACE ISRAEL. Undoubtedly there are blessings directly related to trusting in God from an Old Testament perspective. But the book of Hebrews (New Testament) declares that “without faith it is impossible to please God…Hebrews 11:1” Faith has ALWAYS been a standard God has presented to mankind. But Christian faith and Jewish faith are not the same unless the common denominator is CPR². The Heavenly promise allows for a man to have a hope David knew nothing about. Christian faith in CPR² provides us with blessings both earthly and Heavenly. Furthermore, as Joint Heirs with Jesus Christ we are more than conquerors through Him that loved us because of our Spiritual position IN Christ. This blessed assurance provides us with a Spiritual sweetness words can’t describe and human senses can’t interpret. The faithful, merciful blessings of the LORD are still new morning by morning. The current state of affairs in this world can weight us down humanly. But our position IN Christ maintains our Spiritual footing and we are equipped to stand against any adversity. If you have not tasted of our Savior’s Spiritual sweetness, please get to know Jesus Christ as your Lord and Savior. Every attribute of Jehovah in the Old Testament will become a rich part of your spiritual development as you walk in the Spirit and not in the flesh. This is how we can soar through life living the Conqueror Lifestyle!